International Wireless Data, SMS & Voice Calls cost comparison–India Lowest !! We already know that India is one of the cheapest countries when it comes to Mobile call rates – But lets have a look at exactly how does it compare to other countries in the world. You would actually be quite surprised seeing the mobile rates of some of the western countries – They are probably 100 times more than what we pay. The recently released survey by New America Foundation’s Open Technology Initiative (OTI) compared the costs and types of mobile cell phone packages available to consumers around the world. Do you know that Canadians pay more than 70 times the price we pay for voice calls! Canadians are charged roughly 15 rupees per minute and they are charged both ways (outgoing as well as incoming calls). Japan also has higher call rates, but they are not charged for receiving calls. USA and UK again have call rates which are about 15 to 30 times higher than India. 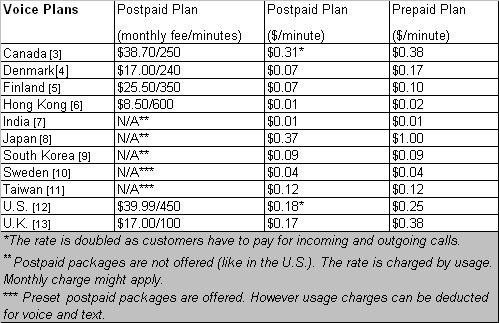 If you think about pre-paid plans the charges are even higher. Think about it, a Japanese pre-paid mobile user pays about 45 rupees per minute ! India is again one of the lowest if you compare per mb cost to the mobile user. While Japanese mobile users pay the highest. If you compared Unlimited data plans, Canadian Mobile users pay about 3000 rupees while in India it is in 1000 rupee range. Sweden has the lowest average mobile data charges amongst all the countries. When it comes to prepaid Data plans, US Mobile users have to pay through the nose – roughly about 450 rupees per MB of data transfer! Again, India is the cheapest when it comes to SMS / Text charges, but other countries are comparable as well. Most of countries offer SMS / Text rates between 1 cent to about 10 cents on average. However, for unlimited SMS /text services India is cheaper than most other countries by a large margin. All in all, we should be really happy that our Mobile services are so cheap and probably the primary reason for the telecom revolution that we are witnessing in India today. "International Wireless Data, SMS & Voice Calls cost comparison–India Lowest !! ", 5 out of 5 based on 1 ratings. Commonwealth Games Closing ceremony – Better than Opening ? Tatas Donate Rs. 220 crore to the Harvard… Justified? Asus Zenfone 5Z vs OnePlus 6 vs Xiaomi Mi 8 vs Honor 10 – Who Will Win? It is pretty neat to see the price comparisons of cell phone plans in different countries, but I would have to agree with with the comments above. There are so many different factors which need to be taken into account in order to legitimately compare which country is actually getting the best value. I know that just looking at the findings for America, I would say that I have lucked out on finding phone service at a very reasonable price. I only pay about 45 dollars a month for unlimited everything with diverse mobility. 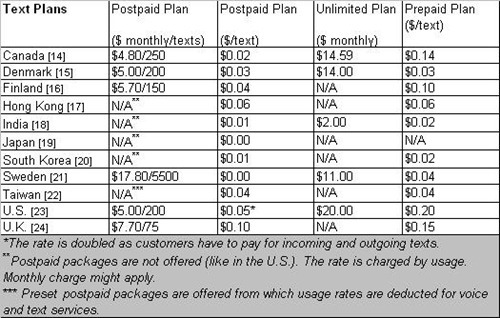 I was with Verizon and was paying the national average, which to me, is pretty outrageous! Nice to see these statistics are good. As A.Prasad points out in his comment, Purchasing Power Parity (PPP) should be taken into account. Is there any study on the call quality in India ? From moving vehicle, we usually notice call drop which does not happen in developed Asian countries. Hi, you can not compare call rates directly on dollar conversion rates. You will also have to consider the earning parity and the actual cost on earnings in that country. Just using dollar conversion rates is absurd.